Ke and Ahn will meet in the best-of-three final on December, 3, 4 and 5. Ke will be vying for his sixth international title; Ahn will be making his debut in an international final. Yamashita becomes Kisei challenger, sets record: The play-off to decide the challenger for the 43rd Kisei title was held at the Tokyo headquarters of the Nihon Ki-in in Tokyo on November 9. 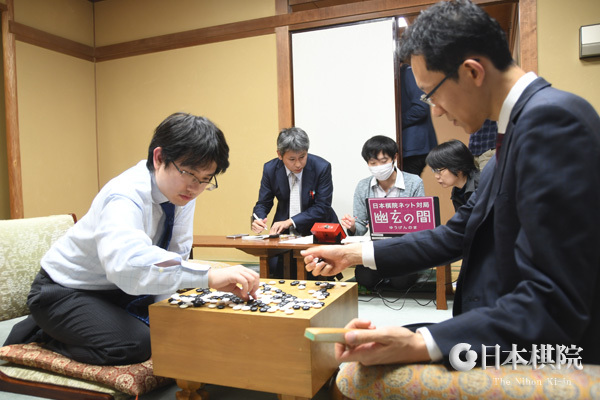 It featured Yamashita Keigo 9P (left), winner of the S League, and Kono Rin 9P, who was second in the S League but who earned his seat in the play-off by defeating Onishi Ryuhei 3P in the final knockout tournament. Taking white, Yamashita beat Kono by resignation. Although the final is called a “best-of-three,” this was enough for Yamashita to win it, as the S League winner starts with a one-game advantage. Unusually for a big game, this also marked a landmark in Yamashita’s career: his 1,000thwin. He was the 24thplayer in Japan to reach this mark and, at 25 years seven months, the fastest. He broke the record set by Yuki Satoshi 9P of the Kansai Ki-in of 27 years one month. The title match with Iyama Yuta will start on January 10. The Kisei will be a familiar arena for Yamashita, as he held the title for one term in 2003 (the 27thKisei) and for four years in a row from 2006 to 2009 (30thto 33rd). He also made three unsuccessful challenges in a row to Iyama Yuta: he lost the 38thto 40thtitle matches (2014 to 2016) 2-4, 3-4, and 0-4 in sequence. This may be a good time to challenge Iyama, as he seems a little vulnerable recently. First, though, Yamashita has to try to win the Tengen title match between the two that is now tied 1-1. A win here would give him a good springboard for the new year. Fujisawa extends lead in Women’s Honinbo challenge: The second game of the 37th Women’s Honinbo title match was held at the headquarters of the Nihon Ki-in on November 9. Playing white, Fujisawa Rina (left) forced the title-holder Xie Yimin to resign after 212 moves. 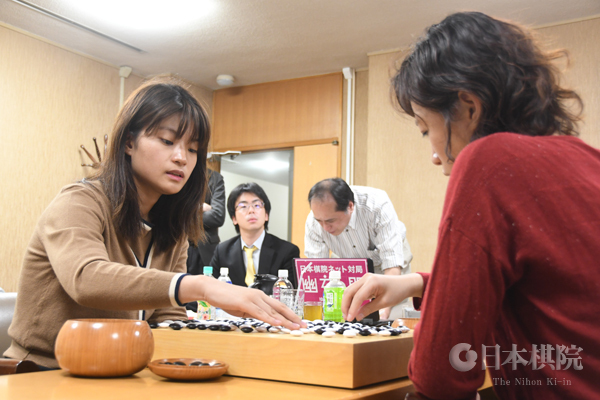 Fujisawa also won the first game, so she needs just one more win to take the title. The third game will be held on November 24. New Faces in Meijin League: The final play-offs for the three vacant seats in the 44thMeijin League were all held on November 8 but at three different locations. At the Nihon Ki-in in Tokyo, Mutsuura Yuta 7P (W) beat Ko Iso 8P by resig. At the Nagoya branch, Suzuki Shinji 7P (W) beat Shida Tatsuya 7P by half a point. At the Kansai Ki-in, Son Makoto 6P (B) beat Fujii Shuya 7P (a member of the Kansai Ki-in) by resig. All three players will be making their league debuts. Son also earned a promotion to 7-dan, dated as of the following day. Matsuura’s win was his eighth and Son’s his seventh in ongoing streaks.